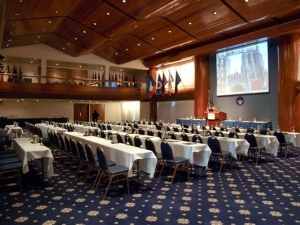 Presentations and lunch will take place in the Ballroom of the National Press Club. Exhibitions and author book signings will be held in the adjacent spaces. Registration for the conference will begin at 8:00 AM at the Holeman lounge entrance. The National Press Club building is located at 529 14th ST NW, Washington, DC 20045. Elevator banks are located at the 14th Street entry. If you are commuting from outside of the city and prefer to use the Metro, the closest station to the Press Club is Metro Center, which is accessible by the Blue, Silver, Orange and Red lines. Located at 607 13th Street NW, it is only a few blocks away from the venue. Chart your course to the National Press Club using Google Maps! 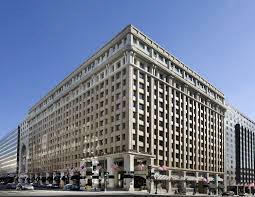 Hotels near the Metro and itineraries for sightseeing in Washington utilizing the Metro to get around. Includes best affordable restaurants highly rated by Yelp! (External website). If your group is arranging discounts on room blocks, please notify the organizers and we'll list them below. There are several parking and transport options in walking distance from the National Press Club for those who are attending the Israel Lobby and American Policy Conference on March 24th. The following list includes the closest parking garages and their addresses, and more options can be found on the National Press Club website. The National Press Club has also partnered with Parking Panda, a parking service that allows you to purchase reserved parking passes close to the Press Club. More information about Parking Panda and how to reserve your parking pass can be found here. No outside food or beverage items are allowed into the ballroom or Holeman Lounge. Self-check coat racks are available, but the National Press Club and organizers are not responsible for lost or stolen items. Attendees are asked to store suitcases, large backpacks or other similarly bulky items elsewhere before attending this event.